In case you are interested here are the two images I used for the banner. 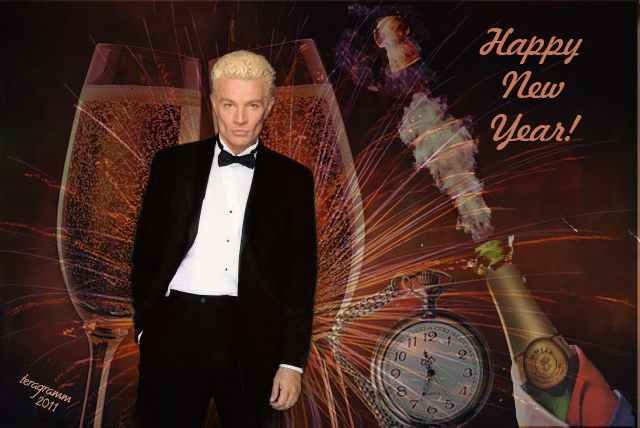 Glad you posted this - it's wonderful - it would be sad to not have Spike New Year Graphics for Noel of Spike. Excellent composite - a great match. NICE with the Popping Cork. Can you PM me with where I can access the original source. I would love to have JM in tux. Glad you enjoyed the banner. I just sent you a link to two JM tux pics, with a long explanation. I for sure don't mind you reposting this one every year -- it's such a festive and glamorous image, and I love me some Spike in a tux! Happy New Year to you too! It is a fun banner and I enjoy it too, that's why I indulge myself and post it each year. My opinion - always a positive thing to see good imagery - I enjoyed seeing this very much. You know, can't ever have too much Spike in my fandom world.